Tensions have flared between Muslims and Christians in Indonesia – the most populous Islamic nation in the world – after a riot broke out last month on the predominantly Christian (c.70%) island of Papua. National newspapers reported that, as Muslims in the Tolikara regency gathered to mark the end of the Muslim month of Ramadan on 17 July, a group of Christian youths threw stones at them and set fire to some nearby kiosks. It was also alleged that Christians prohibited Muslims from praying for a few days beforehand. According to Wandikmo, the police and army failed to circulate the notification. Then, when a group of Christian youths approached the Muslims to ask them to turn down their loud speakers, he says the police took it as a sign of confrontation and opened fire on the Christians, killing a 15-year-old boy and wounding 12 other youths. Tensions soon escalated, prompting the angry Christians to set fire to a kiosk. Flames spread quickly and burned a nearby musholla (Muslim prayer room). 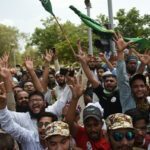 In their statement, the police claimed that they only opened fire after firing some warning shots at the youths, who, they said, refused to leave and even started throwing stones at the musholla. 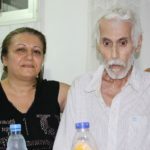 However, a representative for the Christian charity Open Doors International, which works to support Christians under pressure for their faith, called into question the legitimacy of the police’s statement. “The armed forces in Papua have long been known for atrocities and human rights violations against indigenous people,” said the representative, who did not wish to be named. 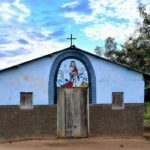 News of the incident in Tolikara spread quickly across Indonesia, leading to a string of retaliatory attacks on Christians and churches. “The shooting and burning created [the] impression that the Church was hostile to Muslims,” Natalius Pigai, the Commissioner of the National Commission for Human Rights, explained. In Solo, Central Java, the Muslim Fighters of Surakarta confronted a GIDI church on July 18 to demand its closure. Two days later, two prayer houses in Yogyakarta and Purworejo were set on fire. On 22 July, the minister in charge of Political, Legal, and Security Affairs, Tedjo Edhy Purdijatno, demanded that security be tightened across the country to protect churches. However, the message seemed to have little effect. First, two churches were forced to close in Central Java. 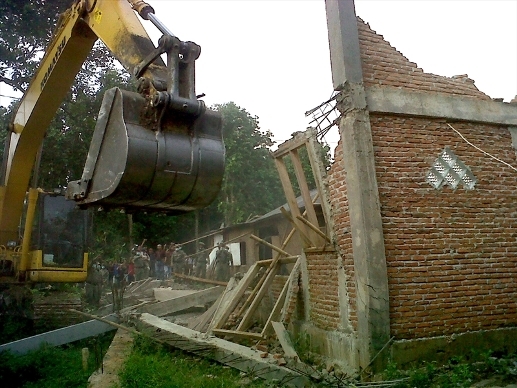 Then, on 25 July, the members of another church in the capital, Jakarta, demolished their own church, after the local government told the church it had not been properly registered and was therefore illegal. 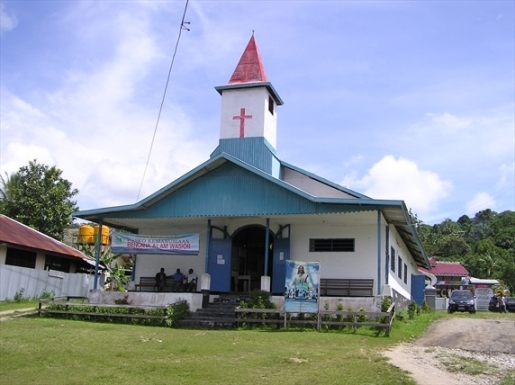 (Many churches have been closed in Indonesia through failure to obtain a permit. These are especially difficult to obtain in Muslim-majority regions of the country.) The church members were told they could either destroy it themselves, or the government would do it for them. That same day, two members of the GIDI congregation were named as suspects in the Papua case. (The local media has referred to them just by their initials, HK and JW, to protect their identities.) Both were accused of instigating a riot and engaging in vandalism. 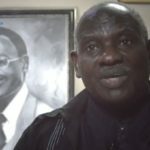 The government is also investigating over 30 police officers involved in the incident, as well as GIDI’s Dorman Wandikmo. However, Jayadi Damanik, coordinator of the Freedom of Religion and Belief desk at the National Commission on Human Rights, claims that law enforcement in Indonesia is often abused to target minority groups. “Law enforcement officers frequently prosecute the minorities with maximum punishment, but at the same time fail to punish the [majority] perpetrators,” he said on International Tolerance Day in November 2014. Muslims in Indonesia account for 88 per cent of the population, Christians around 10 per cent. Indonesia is No. 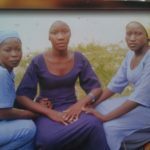 47 on Open Doors International’s 2015 World Watch List and in the early 2000s witnessed a bloody religious conflict that claimed the lives of 7,000 and displaced over 30,000.